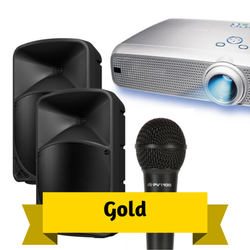 Audio & Video - Gold Package - Spark Rentals Inc.
​Our audio visual packages includes everything you'll need to ensure speeches and slideshow presentations will go off without a hitch. Plug a variety of sources into the speakers, including laptops and SmartPhones, which can also be wirelessly connected via Bluetooth. All equipment comes ready to go for seamless use.